Experiences that become turning points. This quote totally hits the nail on the head in terms of explaining the value of the experiences shared in the new book Turning Points, which will be launched on November 1st. 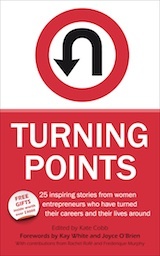 The book contains twenty five inspiring stories from twenty five women entrepreneurs who have turned their careers and their lives around. They talk about the point at which they decided to make a change in their lives. For some the turning point came out of adversity; sickness, disability and bereavement, for others it came from more general life events such as relocation, redundancy and motherhood. Many of the women featured in the book live an international lifestyle and have faced turning points as expatriates living away from their home countries and talk about how their expatriate lifestyle has encouraged and inspired them to re-think their lives and create something new for themselves. Each women has encountered difficult moments and experiences. They could all have decided to take the easiest course of action – none! But they all chose to take big brave steps, following their hearts and their dreams. As a result of these events they have found the strength within to move forward, create and give to others. They share their experiences, their lessons and their tips and advice with you. Even if we can’t see what it is at the time or never understand its significance. All the challenges we face and overcome prepare us for the next adventure in life and make us stronger and better equipped to deal with it. The losses, the difficulties, the failures are just steps along the pathway, and the sooner we can learn from them, the sooner we can move on. Not about other people or circumstances around you. Take ownership for your decisions, your triumphs and your disasters and keep focused on your vision. Be honest with yourself and believe in yourself. Make your development a priority and don’t be afraid to invest in training, coaches, mentors and anything else that helps you understand YOU, then share this with others. Don’t think you have to do it all on your own. You need a team around you to support and help you. Don’t be afraid to ask for help and get others to do the jobs you hate so you are free to concentrate on what you love. Build a network of excellence around you and be prepared to return the favour when needed. Don’t let fear of failure stop you and stand in your way. Think, make decisions and take action based on what you feel to be right for you and not what others tell you. Come from a place of love and be grateful. You’re already doing it so get conscious about it and create a positive future. Everything that you can envisage for yourself is possible and can come about so never abandon your dreams but turn them into reality. Much of the learning and advice contained within the book is very pertinent to the challenges faced by expatriates creating new lives abroad. Looking forward, creating a vision and stepping outside of ones comfort zone with confidence and self belief are some of the methods by which these women have created their own personal brands of success. How about you what success would you like to create for yourself whilst living abroad? The book is officially launched on November 1st. Go to this page and buy your copy – you will be enthralled, inspired and encouraged to do the best with your lifetime experiences – your turning points. This entry was posted in Expat Coaching, Expat Focused, Featured and tagged books, expats, inspiration. Bookmark the permalink. Post a comment or leave a trackback: Trackback URL.